We love pancakes and eat them often. I have several different recipes that we enjoy and make on a regular basis. 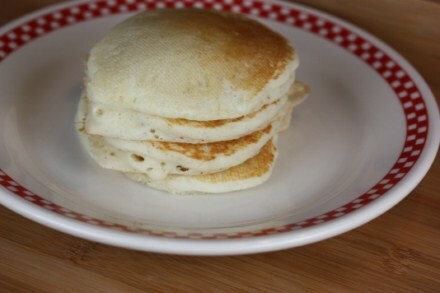 I have one pancake recipe that is a basic gluten free recipe, but it is a little healthier because it contains sorghum. Another recipe that I make often is a make ahead recipe. I love it because I can make the batter the night before. I also have a gluten free pumpkin pancake recipe, a gluten free blueberry pancake, a gluten free cinnamon pancake, and a cornmeal pancake. Yes, I think you can say we love pancakes. Today’s recipe though is a little different. This recipe turns out more like the fluffy mix pancakes that so many people make. And yes, even my family made them on occasion before I went gluten free. 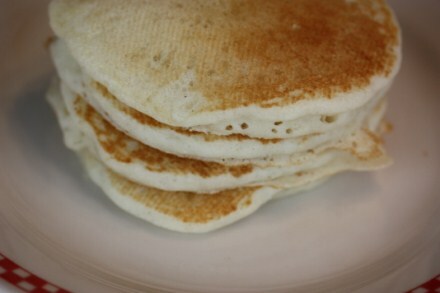 I actually could not believe how fluffy these pancakes turned out. Really, they did not look at all like most gluten free pancakes. I can easily say that these are the prettiest gluten free pancakes that I have made. We love them. In fact, they are our new favorite gluten free pancake. We eat pancakes at least once a week, so I am very glad to have yet another gluten free pancake to add to our lists of favorites. Just a heads up…you listed baking soda twice. Thank you for noticing that. I got it fixed. I appreciate you letting me know. I made these this morning and added chopped up fresh pineapple and shredded unsweetened coconut. To keep them with the tropical theme I also added a little coconut extract and coconut oil instead of the butter. They were AMAZING. And I am quite the pancake connoisseur. I am going to make these into waffles as well. But as far as I am concerned this is my go-to gluten free pancake recipe. Thank you!! Thank you. I am so glad you enjoyed them. I added blueberries to ours this morning and they turned out great. Your tropical version sounds really good. I will have to try them that way. Thanks for sharing it! Absolutely. Its not easy coming across great recipes on the first try. I googled “fluffy gluten free pancakes” this am and this popped up first. So good. My kids love blueberry pancakes so I will make those next time! I also pinned the recipe on Pinterest too. These are too good not to share!! So I tried these as waffles. Same recipe just separated the eggs, whipped the whites and folded into the batter. They came out awesome! Very versatile recipe. And I made them last weekend for family – well I made blueberry pancakes – and they were a hit. Thanks again for a fantastic recipe! THANK YOU!!!! This was about my 4th attempt at GF pancakes, but the first that we actually liked. I will be looking at more of your recipes. Delicious. The recipe made a big batch, plenty for my family of 5. I am so glad that you enjoyed them. Thanks for letting me know! Tried making these this morning, not sure what happened, but the outsides were cooking up nice and brown but the middle would never cook. I tried making 6pancakes then I just tossed the remaining batter. I have made GF pancakes before and not had problems, so I am at a loss ( scratching my gwad here). I am sorry that you had problems with them. I would try turning down the heat a little on them. If the outside got too done before the inside got cooked maybe the heat was a little high for this recipe. You could also try cutting back a little on the xanthan gum. Lynn, I really enjoy your blog, recipes and emails. I have gluten, dairy, and soy allergies. Is there a non-dairy, non-soy substitute for buttermilk? I think that may make a great ask the readers question. I am not diary free, but I know many of them are. I will try to post that for an ask the readers soon. Thanks, Lynn, I look forward to that! Just use a unsweetened non dairy milk ànd add a table spoon of lemon juice to it….let it sit for 5 min and use. We use almond milk original or vanilla unsweetened almond milk. I made these pancakes for my family today. They are the best GF pancake I have made. Thank you for the recipe! I tweaked the recipe a bit, to use what I had. Here’s my substitutions: 1 1/2 c milk Kefir + 1/2 c sour milk with a splash of vinegar, coconut oil instead of butter, guar gum instead of xanthan gum. With the first batch I got about 14 pancakes (using a 1/3 c measure to scoop). My large family gobbled them up and was asking for more, so I had to make another batch (I’m used to making 2 batches anyway. There are 9 of us). I’m thinking of adding some vanilla extract next time, just because I’m used to having it in my pancakes. 😉 Also, I want to try subbing Sorghum (or another whole grain flour) for the white flour to make it a little healthier (as long as it doesn’t change the taste and texture too much). 🙂 Thanks again for such a great recipe. I am so glad your family like them! I have a healthier version that I have made with part teft and a few other healthier grains. Same basic recipe, but a little healthier. I will try to do that soon. I have also used all brown rice flour instead of the white rice. They are a little grainier, but still good. Thanks for letting me know how much you enjoyed them. Oh and they freeze well also. This has been my go to recipe for pancakes. I have modified it a bit more. I have found out that my 5 yr old son and I can have Spelt flour (we are the only ones with a gluten sensitivity), so I decided to try it in them. Today I made them with a flour mixture of sorghum, brown rice and spelt flours. I subbed this for all of the flours and starches. I still added the gum (I used guar gum), because of the GF flours. I also added vanilla. The pancakes were very thick and tasted great. Thanks for such a great recipe. Sometimes we like a thick hearty pancake and these were it! I always make a double batch for my large family. We only had one pancake left, which I suspect will disappear later today. 😉 Maybe one of these days I’ll make some up and put them in the freezer for later, so it’s good to know they freeze well. 🙂 Thanks again! So how excited was I that I found your recipe? VERY! I have gone through 3 different pancake recipes (gooey/heavy/thin) and STILL have not found my Gluten Free Pancake recipe until now!! Thanks Lynn! So I found a conversion chart that shows gluten free flours and how each one is interchangeable from http://www.glutenfreegirl.com —– I bring this up since I did not have white rice flour, but it was pointed out that it acts like a starch, not a grain, so…. I used 1/2c Arrowroot Starch and 1/4c MORE Potato starch instead of. This brought me to add in 1 1/2tsp MORE baking powder as well to help lift the pancakes. One last sub, the xanthan gum. The gums seem to give me a belly ache, so I have been using a substitution (also from glutenfreegirl.com) PSYLLIUM HUSKS!! These work so well! I have made GF bread with them AND now these pancakes!! YUM! I added in 1 tsp of the psyllium husks, plus 1/4c Millet flour & 1 tsp vanilla. One thing with the psyllium husks, you need to let the batter rest a bit so it can soak up the water & bind the flours! Otherwise, a little runny like crepes. But seriously, THANK YOU SO MUCH Lynn for this recipe that I have now found to make pancakes!! I am the one who has gone Gluten free in my family, so I have to be EXTRA creative to make our favorites taste similar to our regular recipes! I am glad you enjoy these. Thanks for sharing what you did. I keep hearing about psyllium husks, so I am going to have to get some to try. The gums don’t seem to bother me, but I know they do a lot of people, so I need to try those. I was wondering if these could be used for waffles? and if anyone has ever frozen them? I freezer these all the time. We often have a few leftover, so whatever is left often goes into the freezer. I put them on a cookie sheet, freeze, and once solid put them in a bag. That way they don’t stick together and we can take out just what is needed. When you substituted Bob’s 1 to 1 flour for this recipe, did you sub it in for all of the other flours (total of 2 1/3 cups) or just some of the flours? Also, do you purchase buttermilk or make it at home? I did the amount of all the flours so yes 2 1/3 cups. Just tried these, using Arrowhead Mills all-purpose blend in place of the flours and it came out as thick as muffin batter. I added at least 3/4 of a cup more of milk, but it didn’t help. Any advice on what went wrong? I have never used that blend so I am not exactly sure, but often with pancakes it is too much gums that make them too thick. Flour blends can be tricky for this reason. The amount of gums that works in a pancake may not work in a muffin or yeast dough. So my guess would be that the mix has too much xathan gum for the best results for pancakes. If you were going to use Bobs Red Mill 1 to 1 GF flour for this recipe, instead of all the different flours, how much would you use? Also could I use a chia seed egg replacer? I would probably use 2 1/4 cups Bob’s 1 to 1. It should work fine. If the batter is too thick you could add a tablespoon or so more liquid. I have not used chia seed in place of eggs in pancakes, but if it works in other pancake recipes, I would think it would work in these. I hope that helps.